EU congestion winner. Graphic TomTom Congestion Index. In car navigation producer TomTom has used anonymised data harvested from its devices to compile a ‘Congestion Index’ for Europe. 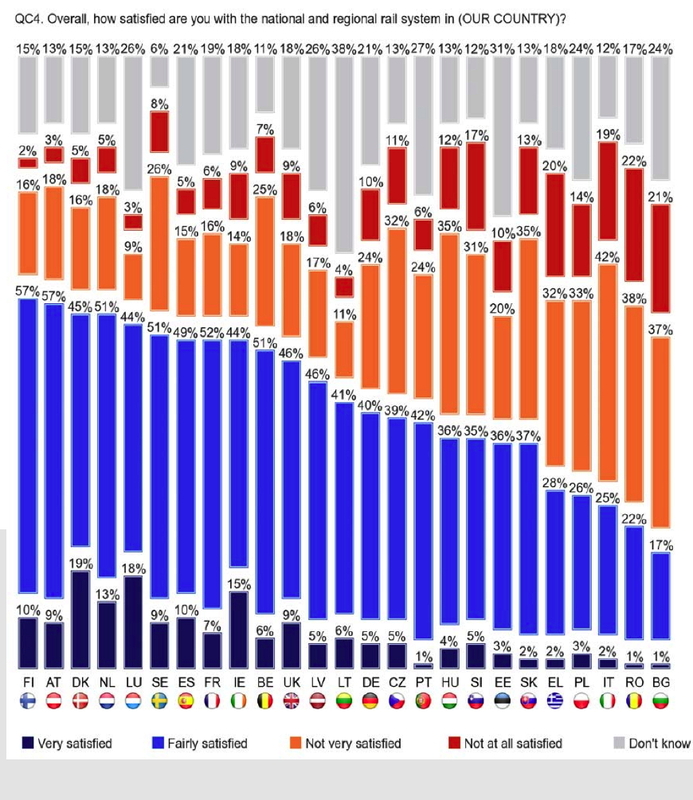 Warsaw is in top place as Europe’s most congested city, followed closely by Marseilles and Rome. The index was compiled by comparing the length of time a particular journey takes in low traffic conditions with the time when traffic volume is at its highest and aggregating the results. On average a peak traffic journey in Warsaw takes 58 minutes longer than its low traffic counterpart. Simulation of a tram journey on the yet-to-be-built route. Video by Olsztynska Telewizja Internetowa for U.M. Olsztyn. Proponents of the planned brand new tram system in Olsztyn have two reasons to celebrate – not only did construction of the new travel system commence on 12 September, but also on 21 September a contract was signed with Solaris for the supply of 15 Tramino trams. Construction works on ul. Ploskiego. Photo U.M. Olsztyn. Olsztyn lost its small 6 km tram system in 1965 when it was one of several smaller Polish towns and cities that decided that trams no would no longer play a part in their future transport arrangements. Olsztyn Tramino. Graphic by Solaris Bus & Coach S.A. The idea of building a new tram system in Olsztyn dates back to 2006 when a radical reconstruction of the town’s transport infrastructure was envisaged. Several different proposals were first analysed by consultants and then subjected to extensive public consultation. The result – a 105 million euro project for an integrated transport systems. 85% of the cost will come from the EU regional development bidget, 15% from the city council’s own funds. When the project is completed in 2014, Olsztyn will have gained a modern public transport system with: ‘intelligent’ traffic lights, dedicated bus lanes and a 10.5 km tramway. Old Olsztyn, Video impresja40; Music Czerwony Tulipan. Building work formally started in March this years, but actual construction work was delayed until September, because of problems with the ‘paperwork’. Meanwhile the procurement of trams was delayed when Pesa challenged the result of the first tender which had been won by Newag-Modertrans. 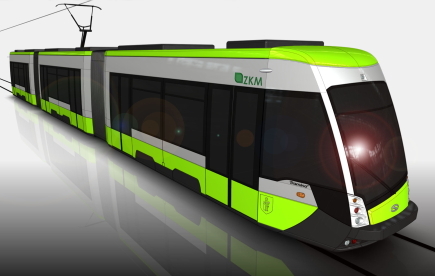 Now, a second tender has been held, all legal obstacles have been cleared, and the construction of trams in the Solaris works in Poznan can begin. 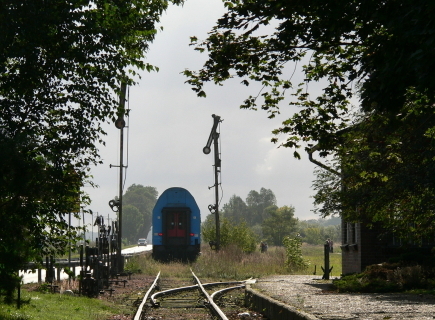 TGM40-9586 and train waiting to depart from Czempin. Photo Michal Koscielniak. The second Piknik Kolejowy, which took place last Saturday, 15 September, was an outstanding success. Thousands of local railway residents and railway enthusiasts crowded the grounds at Srem railway station. Triple overtaking! Photo Michal Koscielniak. 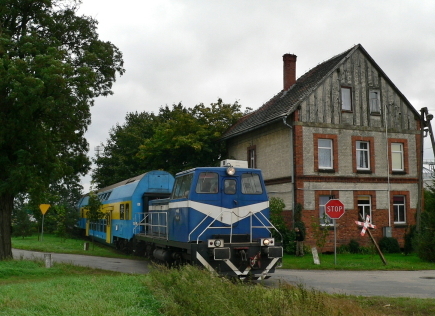 Undoubtedly the biggest attraction was the special shuttle train service that ran between Czempin and Srem on this normally freight-only line which has been taken over by the Srem District Council. Garden railway. Photo Michal Koscielniak. With SKPL operating the trains, Przewozy Regionalne providing the double deck railway carriages and the Srem District Council arranging the various family attractions at Srem station, the recipe proved very popular and it looks as if the ‘railway picnic’ is set fair to be an annual event. Tail lights. Photo Michal Koscielniak. 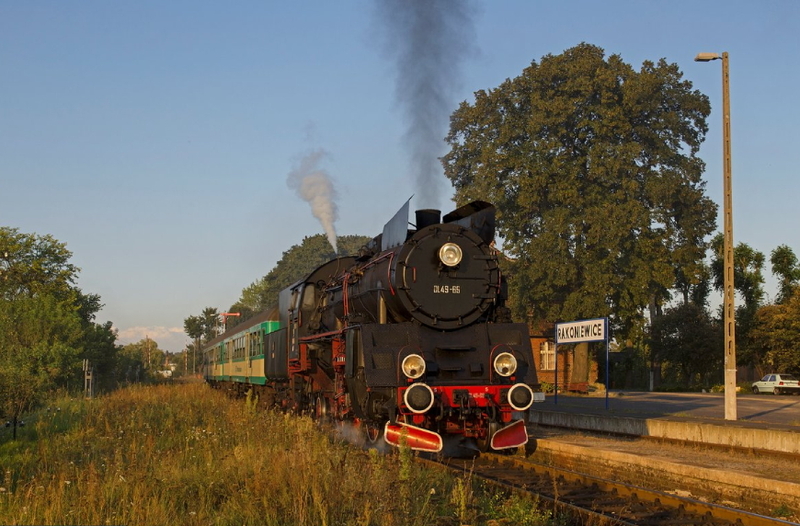 Local rail transport enthusiasts are hoping that the publicity generated by the event may encourage the Wielkopolska provincial government to provide financial support which would enable regular passenger services to be reintroduced on the line. 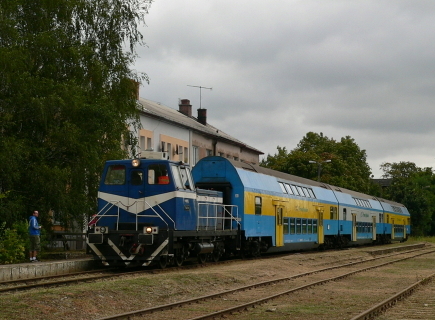 Train ready to depart for Czempin. Photo Michal Koscielniak. Our thanks to SKPL for forwarding Michal Koscielniak’s superb photographs. Biggest rail fair beats records! Solaris 5-segment Tramino, the variant operating in Poznan, but in Olsztyn livery. Photo courtesy Kurier Kolejowy. The largest yet Innotrans – the most important railway trade fair in the world – is over. The organisers, Berlin Messe, estimate that by the time the gates closed this afternoon a record 120,000 visitors had come to the fair. 2,500 companies from 49 countries exhibited their wares. The fair attracted 54 exhibitors from Poland underlying the importance of the railway industry to the country’s exports. Exhibition organiser checks that all the outdoor exhibits are in the right place. Emma waits in the background. Photo courtesy InnoTrans. While the latest locomotives and rolling stock attracted a great deal of interest, the undoubted star of the show during the public open days was Emma, a diminutive 0-4-0T built by Hanomag in 1925 and owned by H. F. Wiebe GmbH. 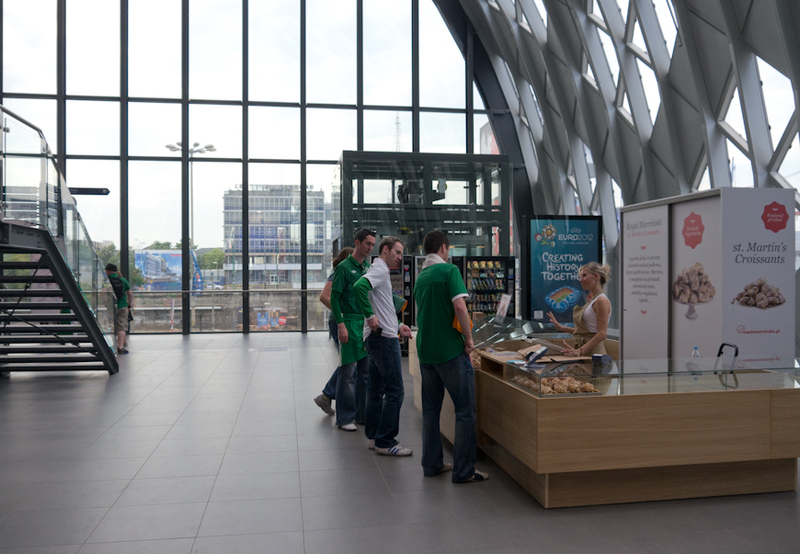 Parts of the new station at Poznan are quite photogenic. Photo BTWT. A resident of Murowana Goslina, a village some 20 kilometres to the North of Poznan, was taking photographs of the new Poznan Glowny railway station only to be stopped by security guard. He was told that photography was forbidden, and when he challenged the ruling, he was informed that a special permit had to be obtained before taking any photographs. When he asked where these permits could be obtained, he was told that the appropriate gentleman, the Regional Director with responsibility for stations, was away on holiday and that such permits could only be obtained after paying a fee. Considerably miffed, our hero took the story to the Glos Wielkopolski daily who contacted the PKP SA headquarters in Warsaw. An embarrassed PKP spokesman explained that, it is true that photographic permits have been introduced for photography at Poznan Glowny, but that these are only required for commercial or wedding photography and there is no regulation in place to stop casual photography. 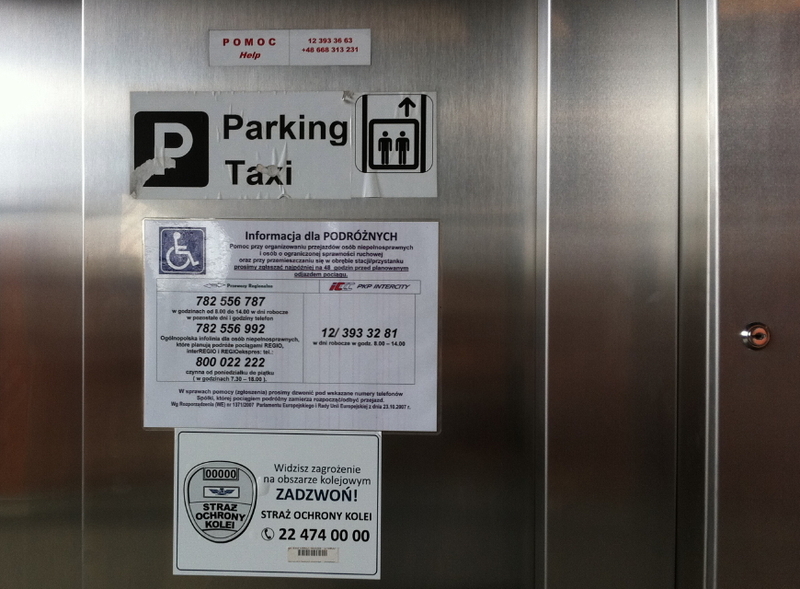 So if you are taking photographs in a public railway location either in the UK or in Poland and are stopped by an over zealous official, do ask to see a written copy of their instructions or failing that their manager. It may well be that it is your persecutor, rather than you, who is operating outwith their remit. With a hat tip to Robert Dylewski. Głos Wielkopolski – Robisz zdjęcia to płać! Still from Genesis, shot on pre-production GH3, courtesy Panasonic. Today at the Photokina Exhibition in Berlin, Panasonic is launching a new camera, the GH3. Now BTWT is about trains not cameras, but hold on. We will get to trains in the end. However, its not the GH2’s ability to take photographs that make it so special. Thanks to Vitaliy Kiselev, a Russian software engineer who has reverse engineered parts of the GH2’s operating system and a team of on-line helpers who have developed ‘patches’ to modify the way the camera codes video, the camera – in the hands of someone who really knows what he’s doing – can shoot video to a quality that matches professional video cameras costing 10 or even 20 times as much, and here no other stills camera – not even the top shelf DSLRs – can match it! Now the GH3 is supposed to have consolidated into an official product many of the upgraded features that Vitaly and his team of hackers have given the GH2. “Supposed to” because as well as adding many impressive improvements to the GH2 spec, Panasonic appear to have taken a major step backwards by giving the GH3 a slightly smaller sensor than that used in the GH2. To showcase the abilities of the GH3, Panasonic employed a team of professional film makers to make the demo short Genesis which is being premièred at Photokina. And Genesis brings us back neatly to trains. While Genesis has lots of images of the sort that appeal to Alpha males: fast cars, smart phone, attractive heroine… it also has its heart-stopping feminine moments. And all of the latter have trains in the background! There’s a particularly dramatic piece of ‘guerilla video’ (shot without permission and with minimum gear) on a subway station and the final dénouement is shot at Travel Town, an amazing transport museum in Los Angles. Sadly, while the emotional impact of trains and railways is understood in Western Europe, it is greatly underrated in Poland. Why else would local authorities be so keen to tear up their narrow gauge railways and lay cycle paths, or tear down their old roundhouses and build shopping malls? Told you we would get back to trains in the end! Philip Bloom – New short film “Genesis” shot on new pre-production “G” camera. Prior to 1970 Rakonowice was the Western terminus of the Smigiel Railway. Here Ol49-69 waits at Rakoniewice Station in the late afternoon on 29 August 2012. Photo © Christian Cederberg. One of the delights of publishing Behind The Water Tower is receiving photographs for publication from our readers. For several years we have showcased the hauntingly beautiful photographs of the Smigiel Narrow Gauge Railway taken by Marek Ciesielski. Sadly the Smigiel line, as it then was, is no more. It hangs on, as a pale shadow of its former self, cut off from its passenger and freight links to the standard gauge network, little better than a ‘funfair railway’ running a few times each year. 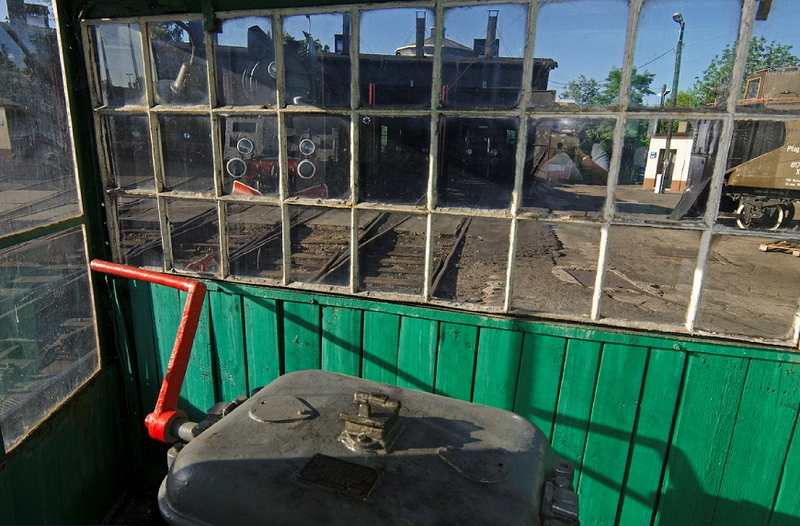 An unusual view of the Wolsztyn roundhouse taken through the window of the turntable operator’s cabin on 28 August 2012. Photo © Christian Cederberg. 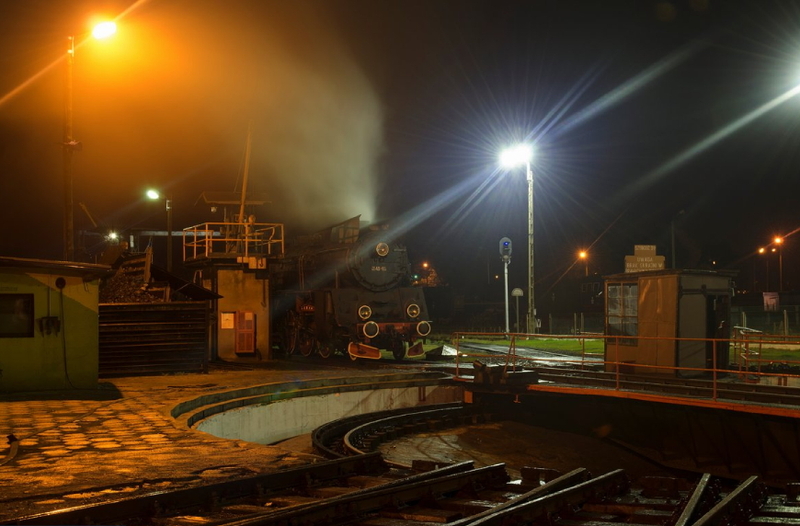 Today we are pleased to feature the photography of Christian Cederberg who lives in Copenhagen and was in Poland for a week at the end of August to photograph the Wolsztyn – Poznan steam services and what other interesting trains he could find. 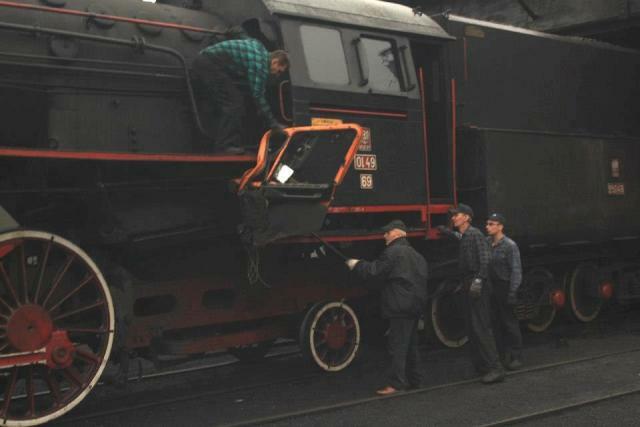 How long before modernizers and those who ‘do not see the point’ bring about the death of regular steam haulage in Poland? 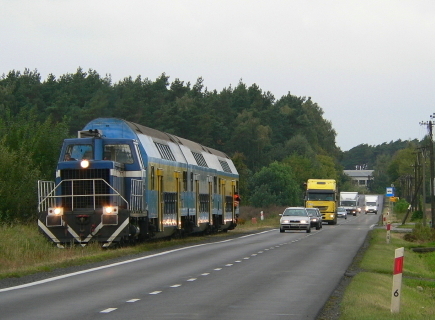 Ol49-59 near Ptaszkowo on 28 August 2012. Photo © Christian Cederberg. 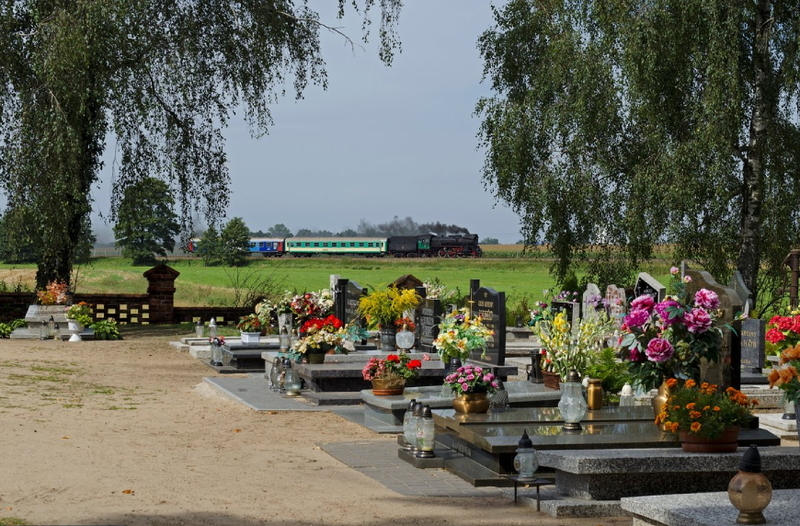 In the end, with nothing stirring that week on the Opatowek-Zbiersk section of the Kalisz Narrow Gauge Railway, Christian decided to concentrate his efforts on the Wolsztyn – Poznan line. We think his photographs are magnificent. What do you think? 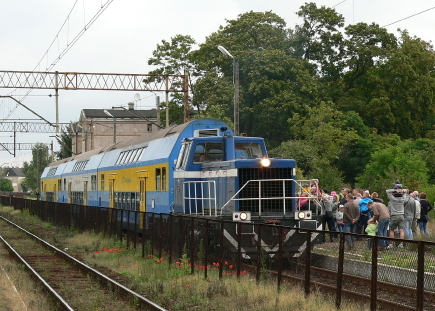 Ol49-69 at Wolsztyn on the evening 28 August 2012. Photo © Christian Cederberg. Christian is the webmaster of www.damplokomotiv.dk – an archive of colour railway photos from all around the world which is well worth exploring. To see all his photos from this trip in glorious full screen size, just click the link at the very end of this post. 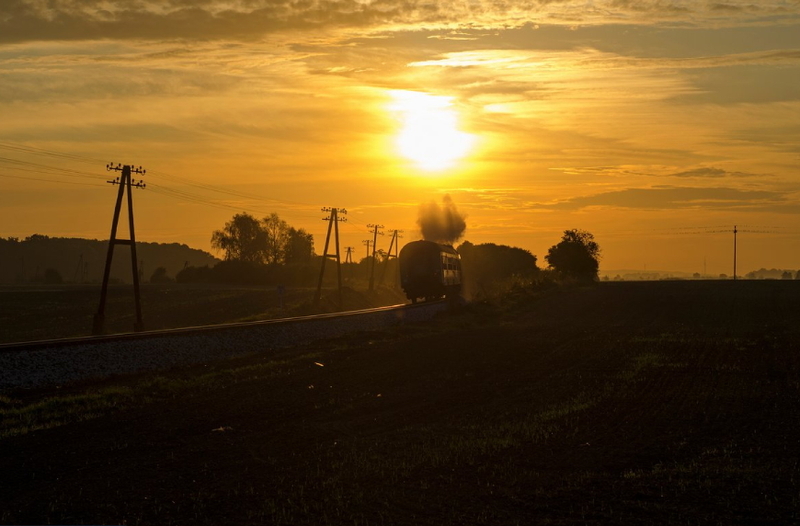 ‘Steaming off into the twilight’ – actually an early morning shot, not evening – Ol49-69 between Granowo and Strykowo on 29 August 2012. Photo © Christian Cederberg.